Thank you all for being such faithful followers and supporters of Classroom 2.0 LIVE. We will treasure all of the memories! Although our live webinars are being discontinued, we strongly encourage you to continue viewing and sharing all of the videos and Livebinder resources in our Archives. An additional bonus is that if you view a recording you can submit a request for a PD certificate by completing the survey found in every Livebinder. Our fantastic certificate creator, Patti Ruffing, will continue to honor these requests and provide certificates through the end of the 2018 school year. Kudos and huge thanks to our team who have worked tirelessly to provide these fantastic learning experiences for everyone! And very special thanks to our Founder, mentor, encourager, advocate, adviser, and source of our inspiration, STEVE HARGADON! NOTE: When you click on the link to log in, enter your OWN full name in the box so we will know who you are (not the topic of the webinar). ﻿Check for correct time in your area using the Time Zone Converter link. Classroom 2.0 LIVE is an opportunity to gather with other members of the community in real-time events, complete with audio, chat, desktop sharing, and sometimes even video. You are invited to join us for our weekly Saturday show with co-hosts Peggy George, Lorie Moffat, Tammy Moore and Paula Naugle! The show lasts an hour, and links for more information and accessing the Blackboard Collaborate room can be found below and on the Using Collaborate page. We strive to make our shows very beginner-friendly, and if you've never participated in a live web meeting, don't be afraid to come and take a peek at the show's format. We would love for newbies to join us and 'dip their toes' in the conversations until you feel comfortable enough to 'jump in the conversations with both feet'! We want to encourage "experienced Web 2.0 users" to join us to contribute and extend the conversation by providing real-life examples and tips/suggestions. 1. A specific topic will be discussed each week with a special guest presenter, so you can be prepared to bring links, ideas, tools you'd like to share. Once a month the special guest will be a "Featured Teacher" who will share ways he/she is using technology to support learning in their classroom. 3. Announcements of upcoming shows on Classroom 2.0 LIVE. 4. 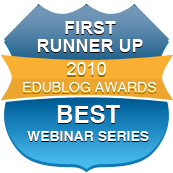 A Livebinder is created for every show that includes all of the links shared by the presenter and participants during the webinar. If you would like to know more about how to access our shows or how to navigate and find things on our website be sure to check out our monthly Livebinders. Click on the tab for "Classroom 2.0 LIVE Resources" and view the screencasts. This short video demonstrates how to find the channel and subscribe. You can also click on this link to go directly to the page to listen or subscribe using this link. NOTE: If you subscribe on iTunesU you'll know immediately when new content has been published. If you miss a show, you will find links to the recorded session under the Archives and Resources tab. Follow-up links and learning suggestions for each show are also provided under the Archives tab . We hope you'll join us to share your ideas and questions and together we'll look for answers. Feedback: We welcome your feedback! Following each show there is a survey that you can complete to request a PD certificate but it is also a perfect place to provide us with feedback about the show! We invite you to leave a comment on show guests, topics, newbie questions or weekly topic of discussion. If you would like to make suggestions for show topics, please add your suggestions to the survey. We are eager to hear your suggestions for either topics or specific people. If you attend a live session and the survey does not pop up when you log out, you can go to the Livebinder and click on the tab for "Classroom 2.0 LIVE Resources" and you will find a link to the survey. Blackboard Collaborate (click for information). 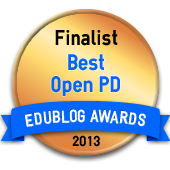 Classroom 2.0 Live was nominated for Best Open PD for the Edublog Awards and was a finalist for 2013! Thank you so much for your support! We are proud to be connected to such an incredible PLN!